This simple mandarin orange vinaigrette recipe is especially tangy because it's made with mandarin orange juice, which goes very well with a salad made with spinach. The dressing can be served at room temperature or warm if you would like your greens to be wilted. Learning to make your own salad dressing is a great skill because commercial dressings often contain high amounts of sodium, fat, or sugar. By preparing your recipe from scratch, you can control what goes into it. 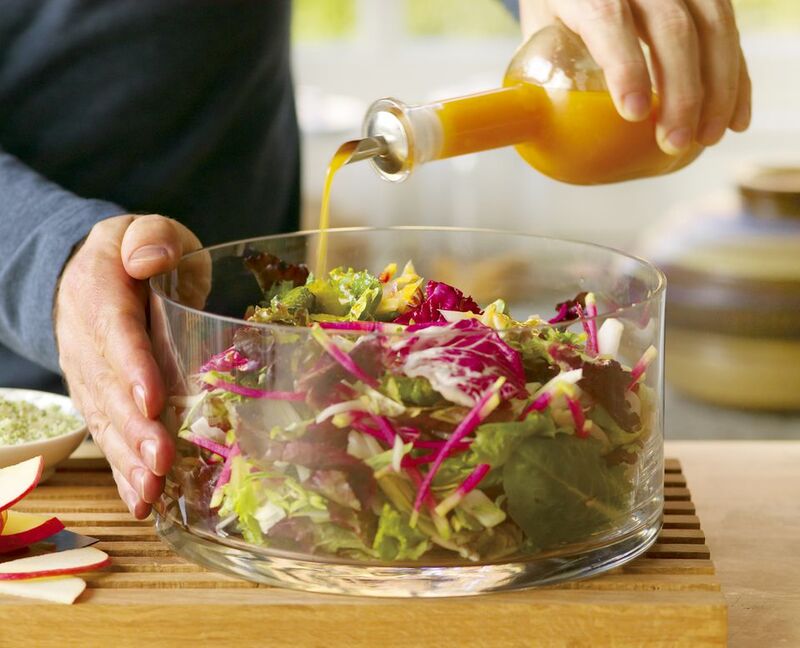 This vinaigrette has a number of health benefits since mandarin oranges are chock full of vitamin C, an antioxidant said to boost the immune system and ward off cancer. The fruit also contains a high dose of vitamin A and moderate amounts of calcium, vitamin B-6, and magnesium. If you pair this dressing with spinach salad, it's all the more beneficial because the same vitamins and minerals found in mandarin oranges are also found in spinach. In addition, spinach is a great plant-based source of iron. Place the cider vinegar, mandarin orange juice, red wine vinegar (or balsamic vinegar), brown sugar, shallots, and kosher salt in a blender. Pulse to combine the ingredients. While the blender is running, very slowly add olive oil in a steady stream through the top opening of the blender. Transfer to a salad cruet or jar with a lid. Refrigerate any leftover vinaigrette for up to one week. After that, throw out any unused portion of this salad dressing. Note: This vinaigrette can be served at room temperature or warm over salad greens by gently heating it in a saucepan for a minute or two. Avoid heating it in a microwave because by doing so, you risk sapping this healthful dressing of all its benefits. If your mandarin orange vinaigrette worked out well, you may be interested in making more orange- or citrus-based dressings. Many contain the same nutrients, such as a citrus-balsamic vinaigrette that is perfect for salmon or a honey-lime dressing paired with seared sea scallops.